During December 2011-January 2012, Lewotolo's seismic activity increased and the volcano produced thick, white plumes that rose as high as 250 m above the summit before subsiding (BGVN 36:12). Since that episode, no further activity was observed through 31 December 2016, except for several thermal anomalies during 27 September 2015-4 October 2015, as recorded by MODIS satellite instruments analyzed using the MODVOLC algorithm (figure 2). Figure 2. The MODIS/MODVOLC composite image that indicates the location of thermal anomalies at Lewotolo between 27 September and 4 October 2015. One is N of the summit (27 September), the others are somewhat E. One of the two hotspots on 4 October appears on the E summit rim. The daily thermal alert maps indicated that the five hotspots were all weak. Information Contacts: Hawai'i Institute of Geophysics and Planetology (HIGP), MODVOLC Thermal Alerts System, School of Ocean and Earth Science and Technology (SOEST), Univ. of Hawai'i, 2525 Correa Road, Honolulu, HI 96822, USA (URL: http://modis.higp.hawaii.edu/, http://modis.higp.hawaii.edu/). According to news articles, 500 people have evacuated their homes on 6 January because of increased activity at Lewotolo. Black smoke rose from the crater and rumbling sounds were reported. On 2 January CVGHM raised the Alert Level from 2 to 3 (on a scale of 1-4). DVGHM stated that the pilot report of a plume emitted from Lewotolo on 25 June was false. Further investigation revealed that the emission was actually from Egon. A pilot reported that a thin plume emitted from Lewotolo was at a height of ~300 m above the summit on 25 July. Ash was not visible on satellite imagery. Plumes and seismic activity at Lewotolo volcano, Indonesia, increased during December 2011 and early January 2012. Lewotolo has erupted potassic calc-alkaline lavas containing as an accessary phase in vessicle fillings, the rare, complex zirconium-titanium-oxide mineral zirconolite (Ca0.8 Ce0.2 Zr Ti1.5 Fe2+0.3 Nb0.1 Al0.1 O7; de Hoog and van Bergen, 2000). 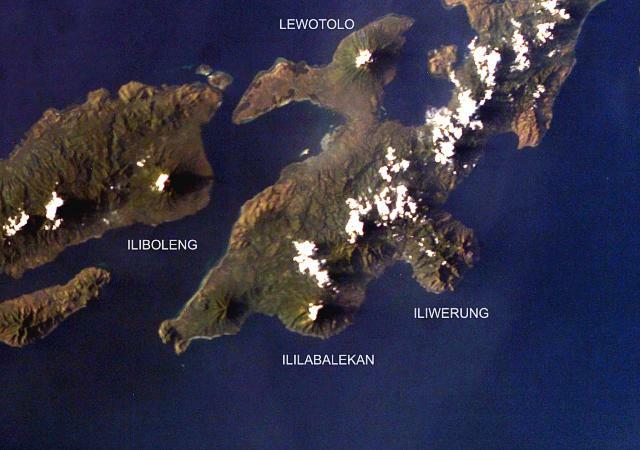 Lewotolo last erupted in 1951. All historical eruptions were small (Volcanic Explosivity Index, VEI 2) with the exception of the first recorded eruption, which took place in 1660 and was as large as VEI 3. According to de Hoog and van Bergen (2000), strong fumarolic activity at the summit of Lewotolo indicates the presence and degassing of a shallow magma chamber. December 2011-January 2012 activity increase. According to the Center of Volcanology and Geological Hazard Mitigation (CVGHM), Lewotolo produced thick white plumes reaching 50-250 m above the summit during December 2011. Seismicity increased on 31 December, and intensified on 2 January 2012 with tremor commencing at 1400. Accordingly, CVGHM raised the Alert Level from 1 to 2 (on a scale from 1-4) at 1800 on 2 January. Between 1800 and 2300 the same day, the maximum amplitude of recorded seismicity increased, and at 2000, incandescence was noticed at the summit. At 2330 on 2 January, CVGHM increased the Alert Level to 3. Under the recommendation of CVGHM, access was prohibited within 2 km of Lewotolo (Hazard Zone III, figure 1), and residents in villages SE of the volcano were advised to keep vigilant and secure a safe place to flee to one of the towns to the N, W, or S in the event of an eruption. Figure 1. Map of areas around Lewotolo showing Hazards Zones I-III. Hazard Zone I includes areas possibly threatened by ash fall and incandescent bombs (within 7 km of Lewotolo, yellow dashed circle) and areas possibly affected by lahars (shaded yellow). Hazard Zone II includes areas possibly threatened by heavy ash-fall and incandescent bombs (within 4 km of Lewotolo, dark pink dashed circle) and areas possibly affected by pyroclastic flows, lava flows, and lava avalanches (shaded light pink). Hazard Zone III includes areas very likely to be threatened by heavy ash fall and incandescent bombs (within 2 km of Lewotolo, light pink dashed circle) and areas very likely to be affected by pyroclastic flows, lava flows, lava avalanches, and volcanic gases (shaded dark pink). Other symbols are explained in the legend at the right. Authorities prohibited access to Hazard Zone III on 2 January 2012. Modified from CVGHM. Residents decide to evacuate. According to Antara News, evacuations began on 4 January spurred by increased activity of the previous few days, as well as minor ash falling in the villages. Antara News stated that most of the residents went to Lewoleba, the closest city to the volcano (~15 km to the SW of the summit). Of the evacuees in Lewoleba, all but about 50 people were reported to have found temporary housing with other residents of the city. On 5 January, Channel 6 News reported that around 500 residents had evacuated leaving their homes in villages surrounding Lewotolo. They noted that residents who evacuated did so on their own accord, as the government had not yet called for evacuation. The Deputy District Chief of Lembata, Viktor Mado Watun, said "Black smoke columns are coming out of the mountain's crater, the air is filled with the smell of sulfur while rumbling sounds are heard around the mountain." According to UCA News on 9 January, the health of the evacuees was cause for concern. Father Philipus da Gomez stated that "there are many refugees who have started suffering from acute respiratory infections." Alert Level lowered. On 25 January 2012, CVGHM lowered the Alert Level of Lewotolo from 3 to 2 following decreased activity after 2 January. The lowered Alert Level restricted access to the summit craters only. CVGHM stated that the observed seismicity (table 1) showed a declining trend, tending towards normal conditions after 23 January. Visual observation revealed thick, white plumes reaching 400 m above the summit during 2-14 January (and a dim crater glow), and thin white plumes reaching no more than 50 m above the summit during 16-24 January (with no accompanying crater glow). Table 1. Seismicity at Lewotolo during 3-24 January 2012, showing a declining trend in seismicity prior to CVGHM's lowering of the Alert Level from 3-2 on 25 January. Data courtesy of CVGHM. On 15 January, direct observation of the crater was made, and revealed incandescence in solfataras, a weak sulfur smell, and hissing sounds in both the N and S side of the crater. CVGHM especially noted that the N side of the crater was quite different than when it was last observed in June 2010, when no solfataras were present. Differential Optical Absorption Spectroscopy (DOAS) measurements revealed fluctuating and increasing SO2 flux between 11-90 tons/day during 8-16 January. References. de Hoog, J.C.M. and van Bergen, M.J., 2000, Volatile-induced transport of HFSE, REE, Th, and U in arc magmas: evidence from zirconolite-bearing vesicles in potassic lavas of Lewotolo volcano (Indonesia), Contributions to Mineralogy and Petrology, v. 139, no. 4, p. 485-502 (DOI: 10.1007/s004100000146). Information Contacts: Center for Volcanology and Geological Hazard Mitigation (CVGHM), Jl. Diponegoro 57, Bandung, West Java, Indonesia, 40 122 (URL: http://www.vsi.esdm.go.id/); Channel 6 News (URL: http://channel6newsonline.com/); Antara News, Wisma ANTARA 19th Floor, Jalan Merdeka Selatan No. 17, Jakarta Pusat (URL: http://www.antaranews.com/); UCA News, Yayasan UCINDO, Gedung Usayana Holding, Lt.3, Jl. Matraman Raya No.87, Jakarta Timur 13140 (URL: http://www.ucanews.com/). Anchoring the eastern end of an elongated peninsula that is connected to Lembata (formerly Lomblen) Island by a narrow isthmus and extends northward into the Flores Sea, Lewotolo rises to 1423 m. Lewotolo is a symmetrical stratovolcano as viewed from the north and east. A small cone with a 130-m-wide crater constructed at the SE side of a larger crater forms the volcano's high point. Many lava flows have reached the coastline. Historical eruptions, recorded since 1660, have consisted of explosive activity from the summit crater. There is no Deformation History data available for Lewotolo. There is no Emissions History data available for Lewotolo. Lewotolo volcano, rising here above the village of Jontona, anchors the eastern end of the northern peninsula that is connected to Lembata (formerly Lomblen) Island by a narrow isthmus. The symmetrical stratovolcano contains a small cone with a 130-m-wide crater constructed at the SE side of a larger crater that forms the volcano's summit. Many lava flows have reached the coastline. Historical eruptions, recorded since 1660, have consisted of explosive activity from the summit crater. 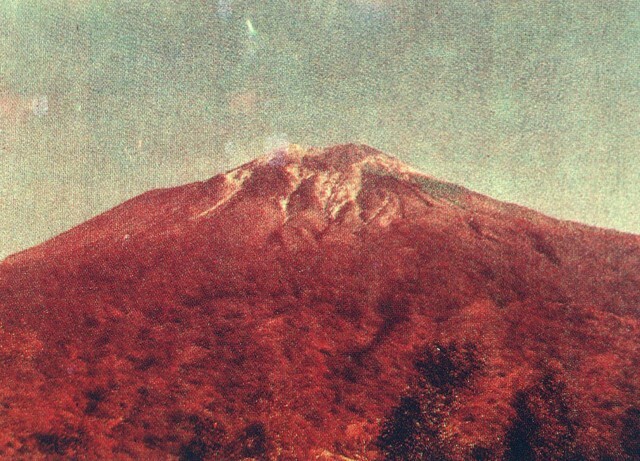 Photo by Kasturian, 1981 (Volcanological Survey of Indonesia). 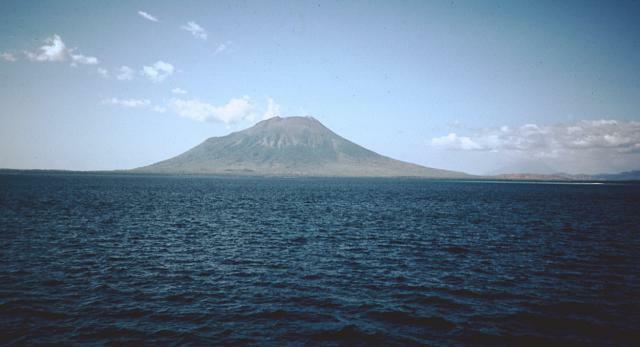 Lewotolo, seen here from the Flores Sea NW of the volcano, anchors the eastern end of the northern peninsula that is connected to Lomblen Island by a narrow isthmus. Many lava flows have reached the coastline of the peninsula. Historical eruptions from Lewotolo have been recorded since 1660 and have consisted of explosive activity from the summit crater. Photo by Rob McCaffrey, 1982 (Rensselaer Polytechnic Institute). There are no samples for Lewotolo in the Smithsonian's NMNH Department of Mineral Sciences Rock and Ore collection. Large Eruptions of Lewotolo Information about large Quaternary eruptions (VEI >= 4) is cataloged in the Large Magnitude Explosive Volcanic Eruptions (LaMEVE) database of the Volcano Global Risk Identification and Analysis Project (VOGRIPA).